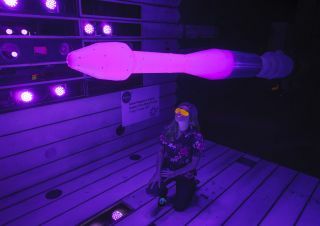 NASA engineer Nettie Roozeboom monitors a generic rocket model coated with hot-pink pressure-sensitive paint that glows under blue light inside a wind tunnel at NASA's Ames Research Center in Moffett Field, California. To see how new rocket and aircraft designs perform under pressure, NASA's aeronautical innovators are painting model prototypes an eye-searing hot pink for wind tunnel tests in California and Virginia. The wild paint job isn't just for looks. NASA engineers are using a pressure-sensitive paint (PSP) that can show — with a dazzling glow — how the surface of a rocket or aircraft model responds to pressure. NASA is conducting the tests in wind tunnels at the agency's Ames Research Center in California and Langley Research Center in Virginia. Oxygen in the wind reacts with luminophores, or fluorescent particles, in the paint, quenching its glow under high pressure. The varying shades of dull and bright pink that result allow researchers to visualize exactly how the pressure is distributed. With a coat of pressure-sensitive fluorescent paint, the hot-pink hue of an aircraft in testing helps engineers at NASA's Ames Research Center in California design new planes that run on half the fuel and produce only one-eighth the noise pollution. "PSP is great because, as long as you can apply paint to the area you want to test, illuminate it with a lamp and view it with a camera, you can gather data you might not otherwise be able to get," Nettie Roozeboom, an aerospace engineer at NASA's Ames Research Center, said in a statement. Understanding how pressure is distributed over the surfaces of an aircraft is important for designing new planes that don't fall apart while flying in high-speed winds. But it also helps engineers build aircraft that are more efficient. With less wind resistance, aircraft require less fuel, emit less pollution and produce less noise. Pressure-sensitive paint covers the blade tips of a helicopter scale model during wind tunnel tests at NASA's Langley Research Center in Virginia. NASA has used PSP to test airplanes for more than 25 years. Today, the agency is working to make more effective PSPs to test vehicles that leave Earth as well. The goal is to create a new and improved PSP that responds faster to pressure while also being less sensitive to temperature than the existing technology is. But there is one thing about this paint that will likely never change: its neon-pink glow.